Turkish police and customs units have seized large hauls of marijuana and smuggled cigarettes and detained dozens in separate operations on Tuesday in their relentless anti-narcotics and anti-smuggling fight. The police in Istanbul seized two tons of marijuana during an anti-narcotics operation Tuesday, Interior Minister Süleyman Soylu said. Soylu said later on Tuesday that five tons of cannabis was also seized in southeastern Diyarbakır province. He added that at least 200 drug dealers were detained in a separate operation, which was launched early Tuesday with at least 4,000 police officers attending the large-scale drug bust in Turkey's northwestern Bursa province. 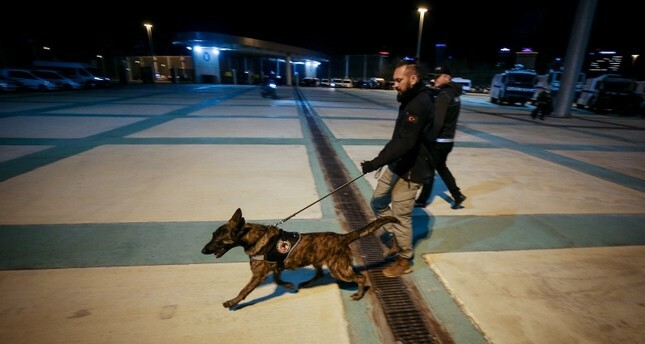 Police special forces, as well as sniffer dogs, participated in the anti-drug operation. Bursa Police Chief Osman Ak said that the operation was the outcome of a five-month-long preparation, adding that the number of arrests stands at 125 as of noon. Meanwhile, in western Izmir province, customs enforcement units have seized 500,000 packs of cigarettes before they were smuggled into the country. Upon receiving intelligence, police started tracking a container allegedly carrying laptop bags from Dubai heading to the Port of Aliağa. A suspicious volume was detected during X-ray control and the container was opened after sniffer dogs reacted.